Bobbi Brown Shimmer Wash Eye Shadow is a sheer, lightly pearlised shadow that softly illuminates the lids and can also be used as a highlighter shade under the browbone. 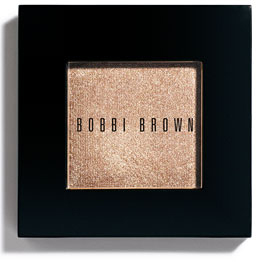 This sleek, flip-top compact can be used individually or assembled into Bobbi Brown custom palettes (sold separately). Available in seven shades: Champagne, Petal, Eggplant, Stone, Rose Gold, Beige and Bone. I have this in the Champagne color and its perfect its the best golden color I have found. Its perfect for day and night makeup and I always get compliments when I use this. Its long lasting very soft and easy to blend and apply and lasts forever. You can also pop this into a pallet with other Bobbi Brown blushes or eye shadows. While its pricey I feel its definitely worth it.